Before the Honda Civic became another Corolla/HyundaiKia competitor, it was really something special. The combination of thin 22-gauge sheetmetal, light and rev-happy 4-cylinder engines, the slickest shifting manual transmissions in the business and pure chassis dynamics made for an entertaining, useful and affordable option that millions of consumers found very hard to turn down. 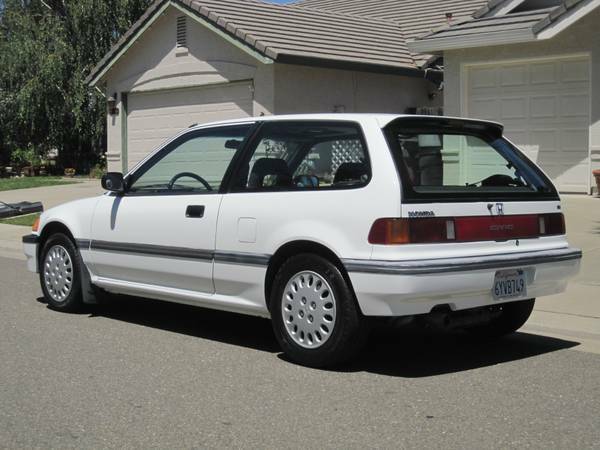 The EF and EG Civic Sis from the late '80s / early '90s were some of the best; sadly, they have mostly been "riced" into oblivion by now and either A) have been crushed and recycled into Taiwanese washing machines, B) have been modified at a cost well past their value, or C) are still stock, but priced like Faberge eggs because of their rareness. 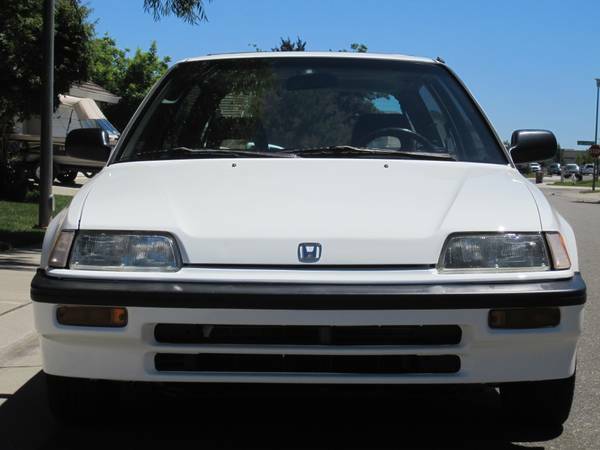 One of our readers has managed to find a 1989 Civic Si that fits nonexistent option D: it's still mostly stock, intact, one color, and...can still be used as reasonably priced yet fun transportation! Find it here on craigslist for $3500 in Elk Grove (near Sacramento), CA. Thanks to Jeffrey L. for the tip! If by some miracle this car has not sold yet, and you are the least bit interested in the hatchy goodness of an Si, it's probably best to jump on it soon. The seller says it has 236k miles, a recent re-paint, and some ripping of the front seats which can be seen in the photos. But if it is truly stock (hey, it still has the original plastic wheel covers) it is a rare find in 2013 despite the minor negative points. We also spy a very recent CA license plate; the 6YVxxx sequence is from no earlier than 2010 so perhaps this was imported from out of state. If so, check for rust and ask for the story. The Si moniker stands for "Sport injected" and dates back to an earlier time when fuel injection was not necessarily standard on a basic Honda. 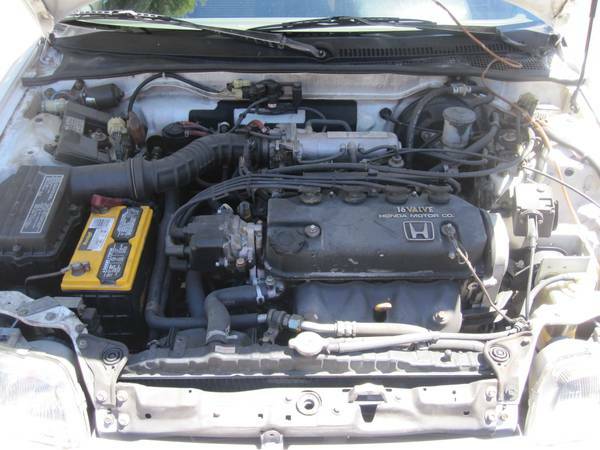 The engine is a D16A6 which displaces 1.6 liters and makes 108 hp. It has individual port injection and a 16-valve head, which would be considered high tech when compared to a contemporary American performance car like a 3rd-gen Camaro. It's not going to win any drag races with a modern Civic or Camaro however; 8.1 seconds from 0-60 is diesel passenger car territory these days. But straight line speed is not the point here. The cockpit tells you exactly what this car is for: transient response. By that I mean it has quick reflexes in the corners; the steering wheel, shifter and pedals are all exactly the right size and fall exactly where you'd expect them. There is nothing superfluous in here. The car becomes an extension of the driver, the horse reads the mind of its rider, Jinba ittai, the monkey howls at midnight...and all that philosophical stuff. This is pretty much the FWD equivalent of the original Mazda Miata when it comes to driving enjoyment on interesting roads but - it has room for four people and some stuff in the back! If you're thinking a hot hatch might make a good commuter, there are plenty of nice, new, powerful, turbocharged, heavy offerings from all the major automakers on your local dealer lots. They would all fit that need just fine. 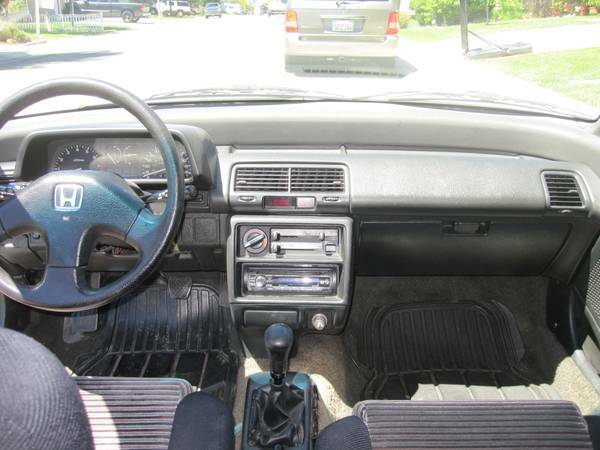 But this thing is less than $4k which is rare for any functional car these days, maintenance will be very easy on the wallet, and should appreciate in value while giving you just as much pleasure as a modern car. It may not be as safe as a modern hatchback, and thieves love them. Sure, it will feel noisy and unrefined but that's part of the point of a Daily Turismo! Hard to find "mostly stock, intact, one color", so true. CFlo nailed this one! Great find.